Our granddaughter, Sophie came to visit us this week. 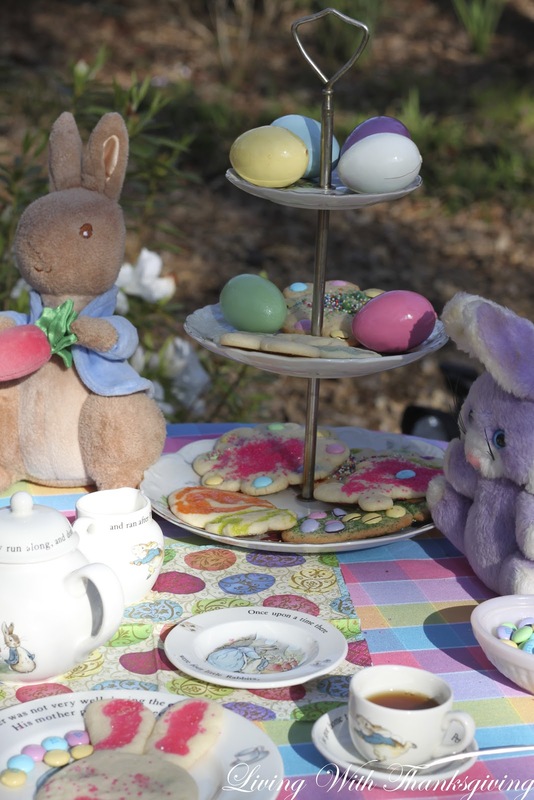 She and I set a tea table, make Easter cookies and had a tea party. The Wedgewood tea set was our daughter's tea set. The day before we had read The Tale of Petter Rabbit by Beatrix Potter and found exactly four stuffed rabbits from our children that I had saved that we named Flopsy, Mopsy and Cotton-Tail. We had a real Peter Rabbit all dressed in his blue jacket. We made cookies several years ago at Christmas but this time she was able to participate more. She was so eager and excited to do everything. As her grandmother I was happy to let her enjoy each step. Sophie did a great job decorating her cookies. She loved the tea and tried it plain and with cream. Linking to: Seasonal Sundays, Tabletop Tuesday, Wow Us Wednesday, Let's Dish and Tablescape Thursday. Oh what fun to have a tea party with your Sophie. She will always remember that. I used to have Teddy Bear Tea Parties with my Kelly. Oh so much fun and wonderful memories. Love the post - have a great week. I just adored your post today..
thanks for sharing y'alls tea party..
Bonnie, this is just so adorable! How wonderful for you to have your lovely Sophie come visit. Pulling out treasures that belonged to our children and enjoying agin with the grandchildren is so special. The little tea set is so sweet. I’ve not seen this size or I would have added it to my collection. I’m sure Sophie couldn’t wait to tell her mommy how she played with her tea set when she was a little girl! We pulled out of the attic our sons’s collection of little cars and given them to Connor. He enjoys playing with his daddy’s old cars! Thanks for sharing your memories while making new ones for Sophie. I love what she told you about “Jesus”. What a sweet wee miss. 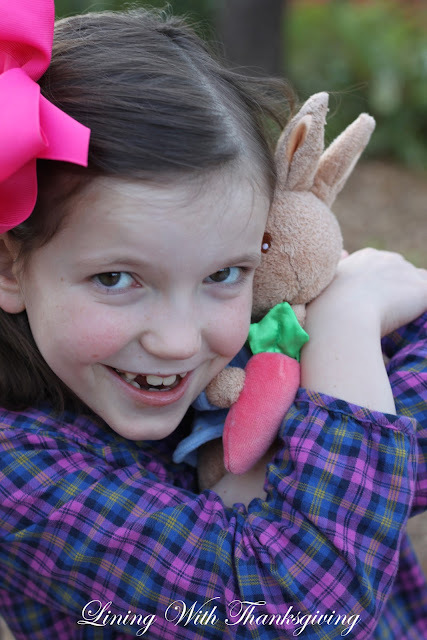 How I miss the days of Peter Rabbit and American Girl. Hopefully some day I will have a similar tea party as lovely as yours. I love this whole post! Sophie is such a cute girl with a very endearing smile. :) I can imagine how much fun the two of you must have had making cookies and tea. Your pastel plaid tablecloth is so pretty, and your vase of azalea blossoms looks lovely. I especially love the Wedgewood tea set. My MIL bought that set when she was in England many years ago, and when I was pregnant, she gave me the plate, bowl, mug, and soap dish. Hubby and I had decorated the nursery with Beatrix Potter, and I was thrilled to receive these Wedgewood treasures. I also have the plush Peter Rabbit with his little blue jacket and carrot. Beatrix Potter, Winnie the Pooh, and Thomas the Tank Engine will always be classics as far as I'm concerned. Oh how fun! Your photos are fabulous and your Sophie is adorable! I can't wait until my granddaughter is old enough for a tea party, but mine is only 1 week old so I need to be patience! love the Beatrix potter china! Oh so cute and FUN! But how wonderful that she know the true meaning of Easter. 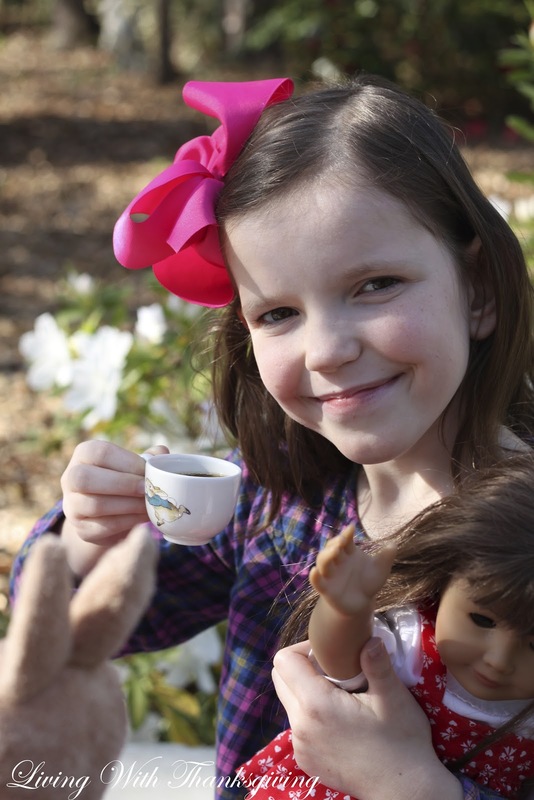 Bonnie~ What a fun tea party with your adorable granddaughter! I'm sure the memories of making those cookies and sipping tea will be one she treasures! Such a sweet tea set and great photos! Wow...she was really into the whole process! The cookies look really cute, and I'm glad you guys had a good time. Working together is what makes it so special. Oh, this post is full of thanksgiving. Who would not be thankful for that darling girl? Love tea parties and yours looks inviting and delicious! Happy Easter! Oh my goodness, Sophia is adorable, what beautiful memories you're making together. She did a great job, would love to have been one of those special guests at the darling tea party. Don't you just love sharing time with the young ones in the kitchen? They are so pleased with themselves when the project is finished. Your Peter Rabbit pieces are all familiar though the ones at my house have been passed on to the daughters. Oh, how precious! Your little Sophia is such a darling little girl and how heartfelt to know she is being raised in the Lord. Bonnie, this brought back sweet memories of baking cookies with my Grandma. I'm glad you and Sophie had the time to spend together - and that she's being raised to know the true reason for the season. Happy Easter to you and yours! My 6-year-old son has recently discovered the Beatrix Potter book. It's amazing that even in this day and age of video games and Legos and electronic toys that he could take so much enjoyment for simple books like The Tale of Peter Rabbit. But he loves them and has checked out every Beatrix Potter story he can find at the library. I bet he and your Sophie would get along quite well. 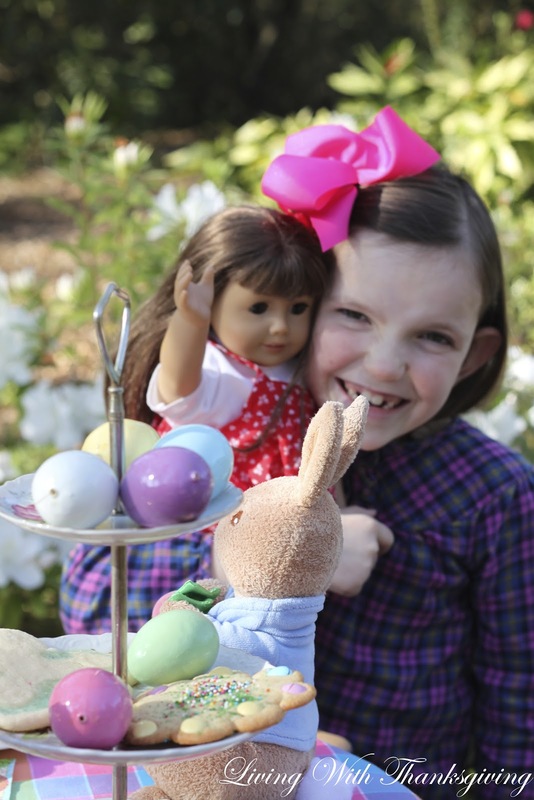 Sophie is darling and so sweet to remember the meaning of Easter. Darling cookies and setting for Easter. So wish I had a set of the little dishes. Ooh Bonnie, that was the sweetest post and your Sophie is an adorable angel!! I know she will remember the special memories of making cookies and sharing tea with you. Happy Easter blessings! What a darling tea party. It has all the elements, lovely tea set, delicious cookies, and a precious little hostess. 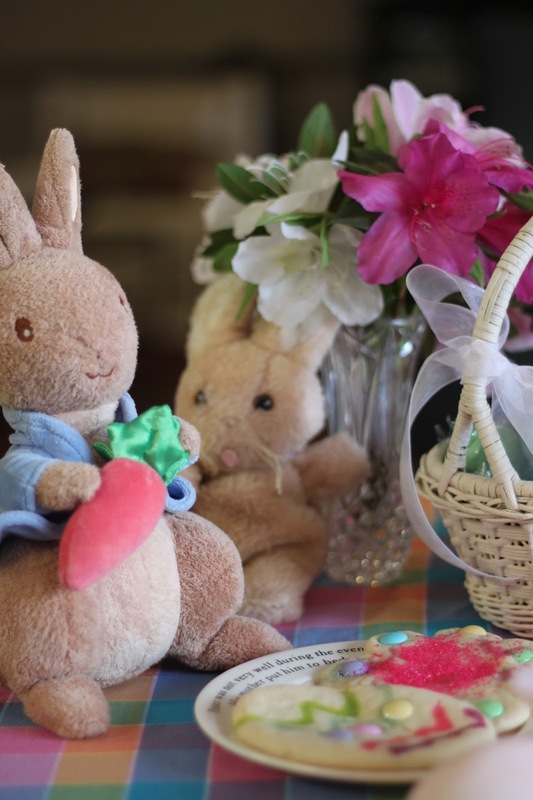 What little girl wouldn't love a tea party with Flopsy, Mopsy, and Cottontail! Bonnie, your pretty little granddaughter looks like a natural when it comes to baking and cookie decorating! She is just adorable. I love her name! The cookies she decorated are so sweet. You just reminded me that I have a cake to make. I have put it off long enough. Also I need to make sweet potato souffle to take to my inlaws for Easter dinner. Hope you have a wonderful Easter! What a precious tea party, wow I bet this tea party will be remembered for a long time to come...love the dishes and the sweet little teapot..
How precious! 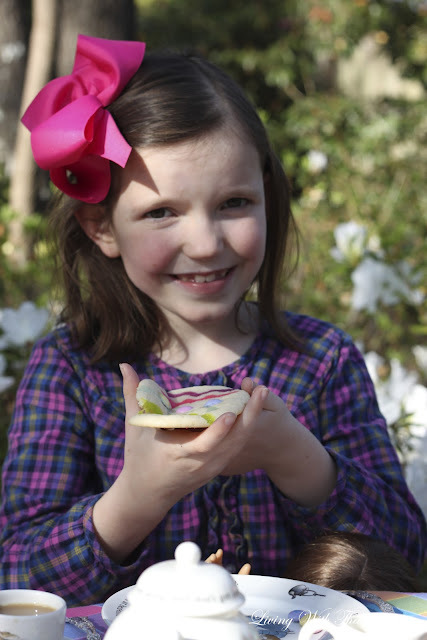 This will be a sweet memory for both you and this darling granddaughter. It's nice that you have all these great photos of baking the cookies and having a Peter Rabbit tea together. Happy Easter! I love her name, goes great on a beautiful girl like your grand. How fun and memorie making to make Easter cookies and cotton tail with your lovely little girl. I love the cute teaset..wish my grand girls were close by me, so I can have all this fun. Wish you both and the rest of your family a happy and blessed Easter. Thank you for your sweet and kind visit, you are such a special lady. It looks like a wonderful time was had! Hi, Bonnie, Thanks for stopping by and leaving a comment. What fun memories you are making with your little granddaughter. I love those Peter Rabbit dishes, and those cookies are so cute. I wish I could be more crafty. That is so precious! What great memories you are making! I remember this sweet post Bonnie! 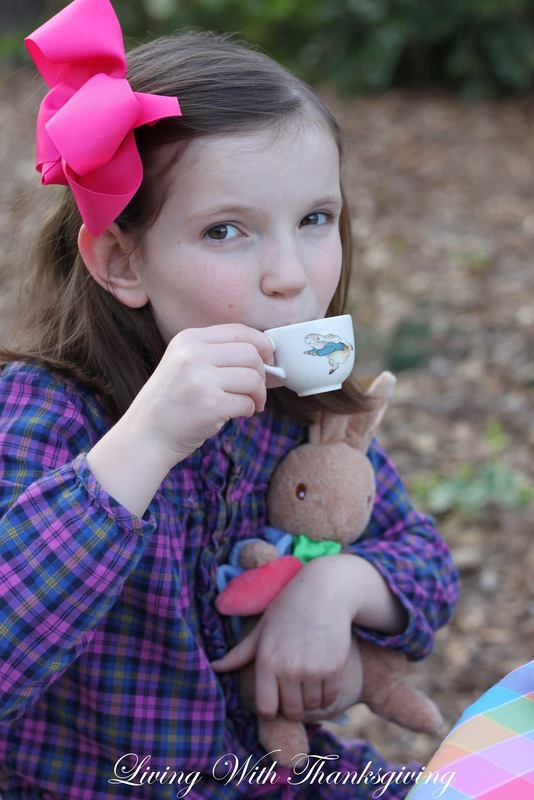 Love that adorable Beatrix Potter tea set!